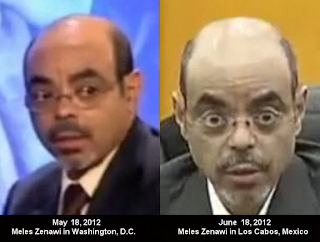 July 18, 2012 — Agence France-Presse (AFP) has just reported from Brussels that Meles Zenawi, Ethiopia's longtime ruler, is in "critical" condition and that his "life is in danger." Citing several western diplomatic sources, AFP is the first major western news agency to claim Meles' health status as being in a critical state. The Ethiopian government has also cancelled a scheduled news conference on Meles' ailing health today, raising further speculations that the regime is in no mood to admit the 57-year-old prime minister is gravely ill and near death. Voice of America's David Arnold first reported the government would give a news conference on the premier's health yesterday, however, our sources in the capital confirmed it has been cancelled. Meles, who has battled substance abuse his entire adult life, has not been publicly seen in weeks. Last Monday, his hand-picked deputy prime minister and foreign minister, Hailemariam Desalegne, confirmed Meles is in poor health, but declined to give specifics.